This monument was created by designer Lee Rich, project manager at Drumey Rosanne Anderson Architects of Waltham, MA. The granite monument’s carefully chosen symbols are from the artist’s conversations with GWOT veterans’ and inspired by their stories. 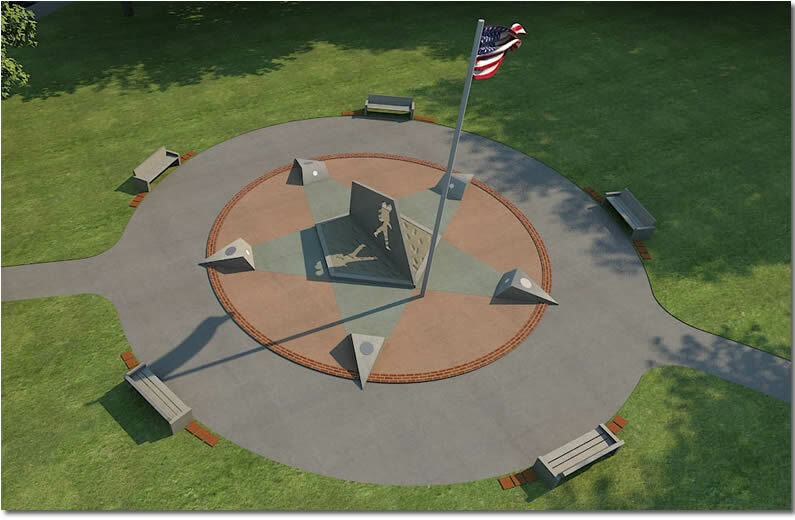 The design for the monument is a 5 point star, with a circular walkway around it. Each point of the star represents a branch of the service: Army, Navy, Marines, Air force and Coast Guard. At the tip of each point the emblem of each specific branch will be displayed embedded into the stone. In the center of the star is a pentagon with a granite slab that will rise 7 feet. On each side of this granite wall there will be a relief of Iraq and Afghanistan and a life-size, cut out silhouette of a soldier walking away from the countries toward the American flag. Viewed from either side the soldier is walking away from each of those counties, headed for home. In the middle of the pentagon are combat boot prints in concrete the color of desert sand. The footsteps will journey toward the American flag traveling away from the country to symbolize the journey home. Not all of the footprints will extend all the way across the pentagon to represent those solders who did not return home. The color of the monument will be sand, as these veterans said “Sand was everywhere”. Connecting the points of the star will be three rings of bricks with the name of any veteran who has served in the US Armed Forces. The inner ring will be reserved for GWOT (Global War on Terror) veterans only. The inscribed bricks are a permanent tribute to men and women who have served in the Armed Forces of the United States. These lasting tributes are not limited to service in the Global War on Terror and can encompass any service period. The veteran NEED NOT be a resident of Pepperell or the State of Massachusetts to purchase a brick. 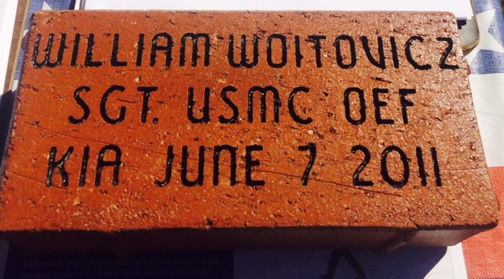 These red bricks are locally made and will be engraved with the veteran’s name, rank, branch and years of service. 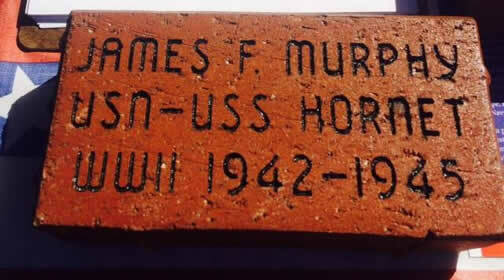 Patrons are encouraged to purchase bricks to memorialize their loved ones and ancestors. If you would like to participate, but do not personally know a veteran, the committee has a list of deserving veterans and would be happy to assign one to you. Surrounding the monument is a walkway with granite benches so one may sit and reflect. These maybe purchased for $10,000. Adjacent to the benches are large 12 x 12 pavers for donors giving $1000 or more.